Simple, evocative rooms show how family tradition has held up for a century at a family camp named Bungalowen. 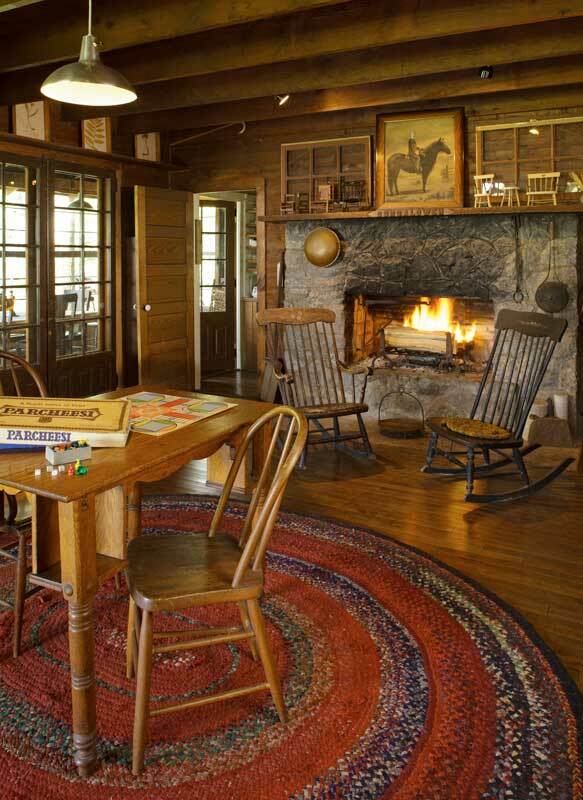 The main living room, with its massive stone fireplace, is the center of the original 1911 cottage. Their honeymoon began when Ray and Theo Pickford Owen left from the east side of Madison in a flat-bottom rowboat in 1906, rowing down the Yahara River toward Rockford, Illinois. The young couple spent the first night camped on the shore of Wisconsin’s Lake Monona, under the oak trees. 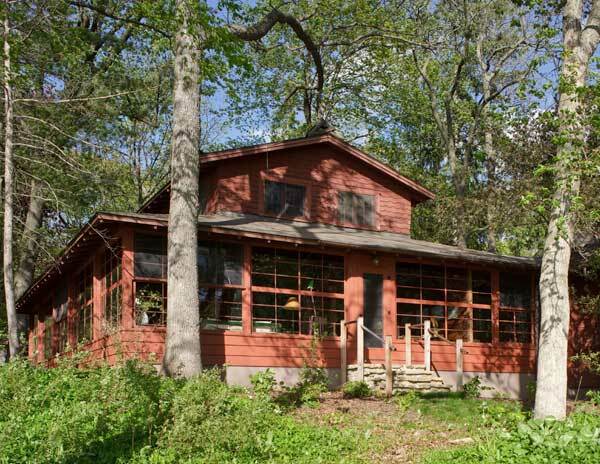 In 1911 they returned to their romantic spot to build a modest summer cottage where they had camped. At first it was just two rooms: a large living space anchored by a massive fieldstone fireplace, with a kitchen behind it. Soon they expanded the space with screened porches running along the north and west walls. That’s the cottage we see here, now inhabited by the Owens’ granddaughter, Jan Marshall Fox, and her extended family. The spirit of the house is essentially the same. 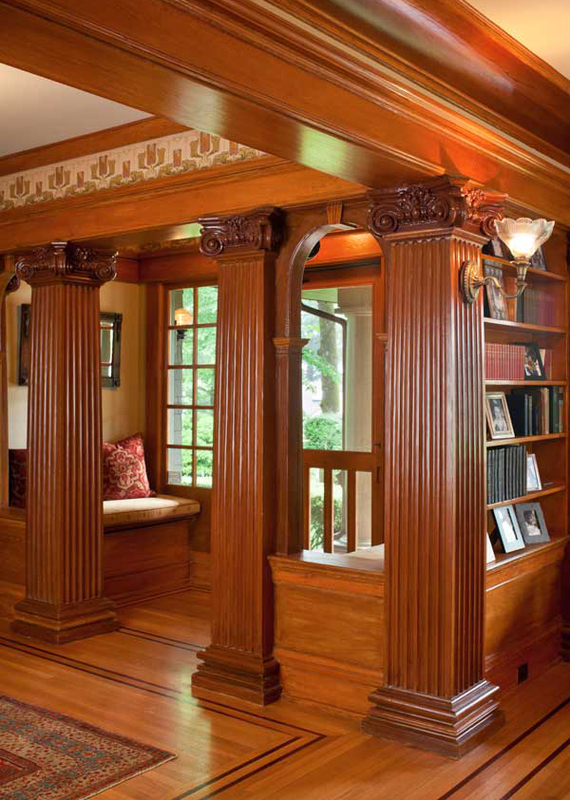 In the 1920s, Ray Owen rescued 1880s commercial windows to glaze the porches, and used French doors to separate the living room from the porches. The property has always been called Bungalowen. Ray and Theo and their three daughters, among them Jan Fox’s mother, Sally Owen Marshall, spent every summer at the cottage. In the early decades of the 20th century, theirs was the only house on the lake. Access then was by water; a small steamer brought visitors from Madison to Angleworm Station, the closest stop to the cottage. Jan’s mother told her that as soon as the steamer came into view across the lake, Jan’s grandmother would get ready for company by putting the coffeepot on the stove and heating a curling iron in the kerosene lantern so she could curl her bangs. In 1932 the family built a somewhat larger, winterized house next to the cottage, linked through an entry hall and sewing room. 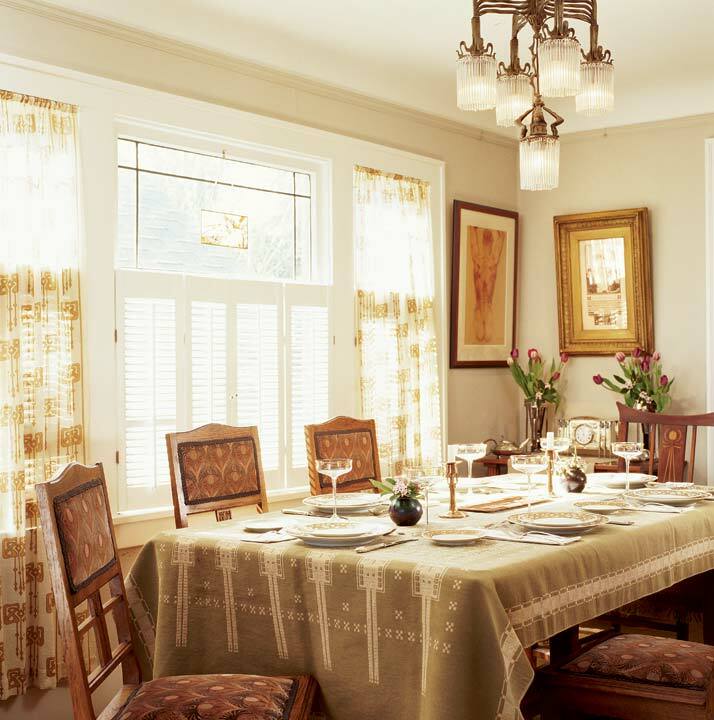 A dining alcove, along with more bedrooms and baths, made the house a comfortable residence. (The family used it year-round during the 1950s.) Cousins—11 in all—and extended family took advantage of the idyllic summers on the lake, fleeing the city’s heat and the polio scare. Furnishings were simple, befitting a cabin filled with children: a square piano, wicker couch, and a ping-pong table filled the living room, and daybeds were scattered on the porches. Mr. Owen built a 12&apos;-long plank dining table with screw-in pipe legs for the porch. Upstairs, all the grandchildren stayed in two large bedrooms: older kids in the one called the Hen House, younger ones in the Pig Pen. Daily chores, called “bungles,” were listed on a blackboard, and the children had to complete theirs each morning before playing outside. Jan’s parents moved in permanently in 1959 and winterized the cottage for Jan’s grandparents, who brought their collection of hooked and braided rugs, travel souvenirs, and Early American-style furniture. Jan inherited the property and moved here in 1973. The house was over-full, so her first task was to sort and store the family keepsakes. Rugs and quilts made by her grandmother and great-grandmother were brought down from the attic, along with Victorian toys and vintage sporting equipment from the basement. 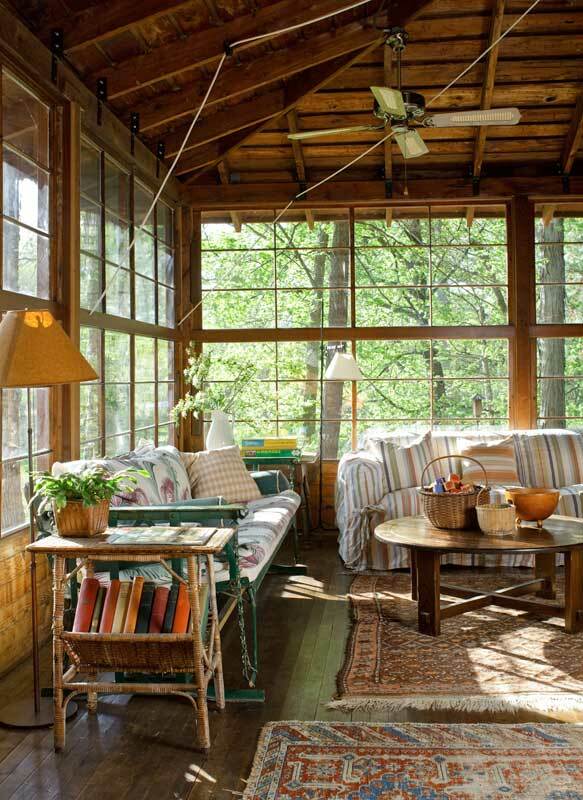 Afternoon light streams into the enclosed porch on the northwest corner, lakeside; the old ropes and pulleys are used to raise the windows. In 2006 Jan hired an architect, who identified three projects necessary to preserve the structure: replacement of the stone pier foundation, which was sinking; addition of wall and attic insulation where feasible; and rebuilding of the glazed porch windows. By now Jan had found the original ledger detailing how the cottage was built; the plans had been drawn by James and Edward Law, fraternity brothers of her grandfather who became prominent Madison architects. Identical new frames were made for the porch windows, which were reglazed with the 1880s glass. A new slab went in under the kitchen area, and the space was rebuilt on the same footprint. Turned over and sanded, the old wood was used to rebuild wall paneling and shelves in the kitchen. This year, 2011, is the 100th anniversary of the original cottage, which will see celebrations this summer. Jan Fox knows she is the steward for Bungalowen, and her goal is to make sure future generations enjoy it as much as she and her family have. 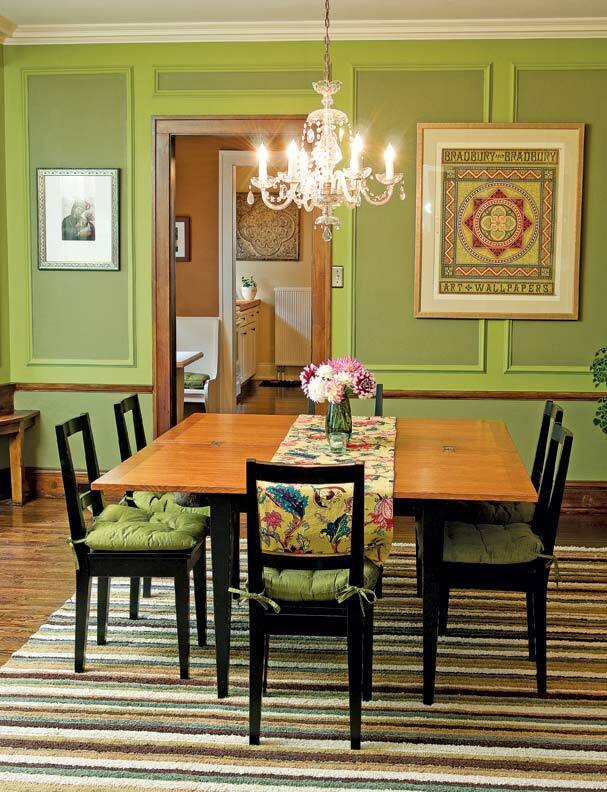 If you keep it simple, you can restore a period home on a modest budget.